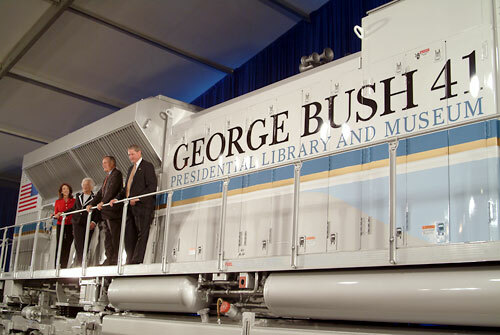 Omaha, Neb., October 18, 2005 – Union Pacific is paying tribute to President George Herbert Walker Bush with a custom-painted locomotive. 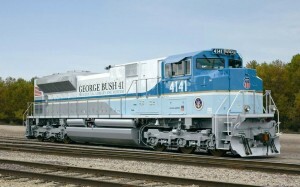 Incorporating colors and elements of the Air Force One used during Mr. Bush’s presidency, the new Union Pacific locomotive bears the number 4141, in honor of the 41st president. The special locomotive, which replicates Air Force One’s design as a striking symbol of national pride and strength, was revealed to the former president during a ceremony near the George Bush Presidential Library and Museum on the Texas A&M University campus in College Station, Texas.